We’d love your help. 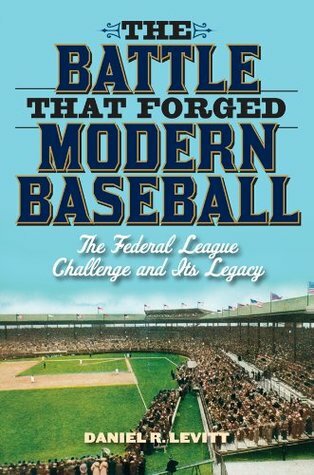 Let us know what’s wrong with this preview of The Battle That Forged Modern Baseball by Daniel R. Levitt. To ask other readers questions about The Battle That Forged Modern Baseball, please sign up. Well-researched, well-organized account of the Federal League, which had an impact that lasted much longer than its three years. The information on the business side of things was very thorough, but I would have liked more on what was happening on the field, particularly which players stood out and what they did. The book mentions Benny Kauff as one of the stars of the league but doesn't go into much detail on what he hit. Looking at his numbers and comparing them to what he did in the NL after t Well-researched, well-organized account of the Federal League, which had an impact that lasted much longer than its three years. The information on the business side of things was very thorough, but I would have liked more on what was happening on the field, particularly which players stood out and what they did. The book mentions Benny Kauff as one of the stars of the league but doesn't go into much detail on what he hit. Looking at his numbers and comparing them to what he did in the NL after the Federal League folded, it seems clear the level of talent in the Federal League wasn't major league, despite what they were trying to pass themselves off as. I would have liked to have gotten a better feel for exactly how the talent stacked up overall. Early baseball history - from 1913 to 1915, an upstart Federal League challenged "Organized Baseball" which meant the National League and the American League (the junior circuit). The closest things got to breaking the stranglehold owners had on baseball players until Marvin Miller and modern free agency. A really niche topic - I love baseball but I found it more than enough information than I needed about the topic. It tells the 'facts', I'm sure, but easily could have been delivered in a more Early baseball history - from 1913 to 1915, an upstart Federal League challenged "Organized Baseball" which meant the National League and the American League (the junior circuit). The closest things got to breaking the stranglehold owners had on baseball players until Marvin Miller and modern free agency. Dull and heavy at times with an ending that doesn't really explain the title. Still, it provides an interesting glimpse at Federal League history. Well documented forgotten era in the game's history. On and off the field maneuvering is covered extensively and it is loaded with "I didn't know that" moments. Recommended. very good account of the league, owners, beginnings & demise. Interesting account of how baseball was like in the old days. Gives the reader a good perspective of how things were.